I have a skater girl, surfer girl, extreme sport loving girl. I could not love her more. She may not have all of the abilities, but she has the heart. 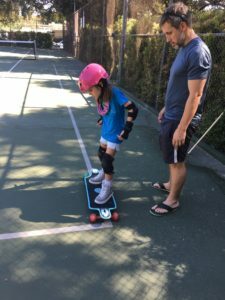 Last year, when she asked for a skateboard on her Tobii eyegaze tech computer. I thought she had made a mistake. Hello? Presume competence mom! She meant it. So immediately I try to find the exact skateboard for her. Then try to figure out how we can adapt it to her. She was adamant that she wanted a skateboard not a scooter. Which really, either way, there was going to be a lot of adapting. As per usual, Magnolia proved me wrong. No adapting necessary, just some reassurance and faith. Of course, dad is always up to the challenge. At the start of the summer, he told Mags, he would teach her. So AJ and Magnolia have been going to the park. 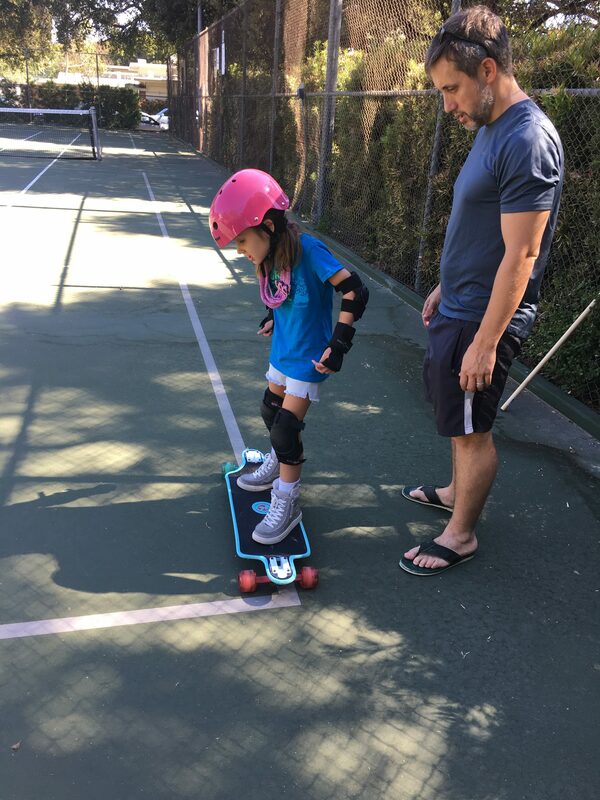 If you see them, you will find the most inspiring little girl geared up and trying to skate. 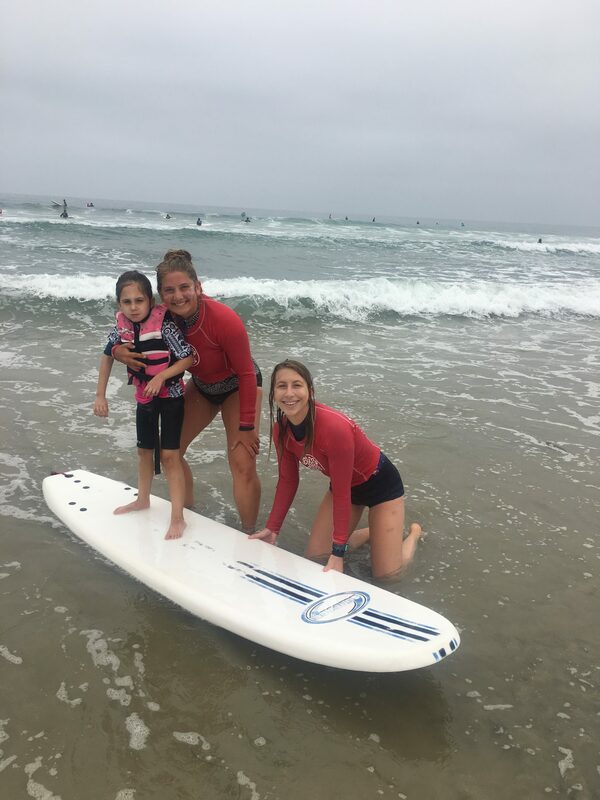 The other thing Mags told us she wanted to do for the summer was go to surf camp. We live in Los Angeles, you would think this would be easy. I searched and searched and found nothing that would work for her. I just didn’t bring it up again. 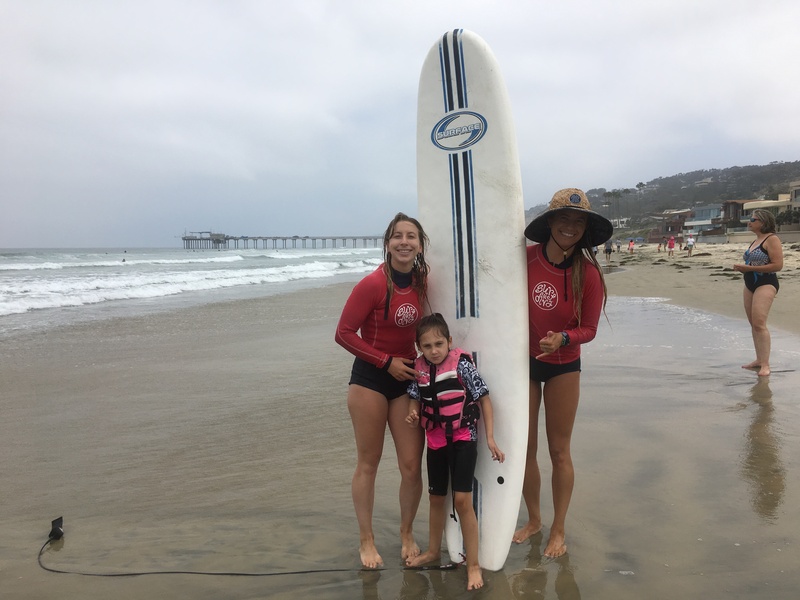 Then I kept seeing social media posts of friends with kids Magnolia’s age, all in surf camps. Dammit! Its not fair. Its all she wanted. 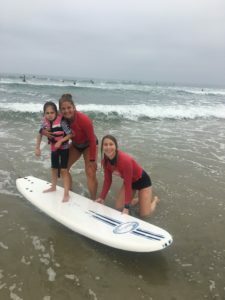 So we decided we would create a surf camp for her. We planned a family vacation to La Jolla Shores (San Diego) booked her private surf lessons with Surf Divas for all the days we were there. Mags was thrilled. Surf Divas was amazing. 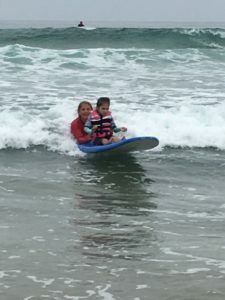 This was her third year to surf with them and we are always happy. I think we just found a family tradition. 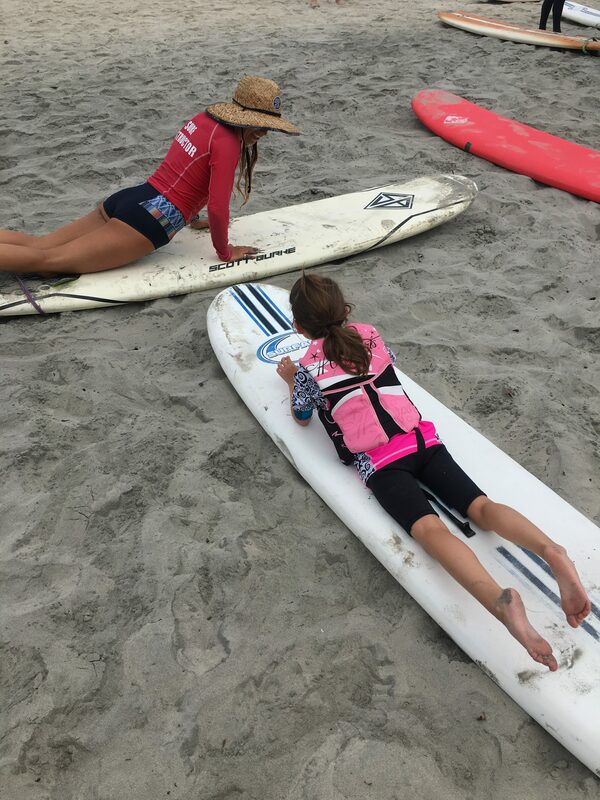 Surf camp! 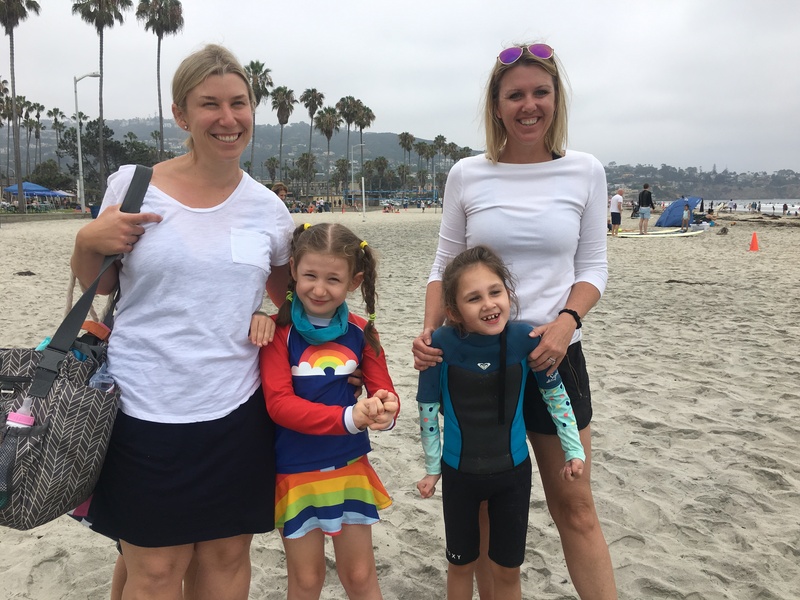 Bonus, we also met up with another Rett family from Texas that happened to be vacationing in La Jolla. 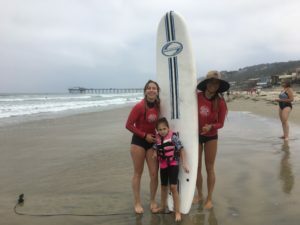 They signed their daughter Catherine up to surf with Magnolia. It truly was a memorable experience. Look, as far as I’m concerned, our motto is, “Live Big”. She will be able to do anything she wants to do. I’m starting to feel, we have set ourselves up for some extreme situations, but I’m all in. Just let me get a little bit of research in, but then she will reach for the stars. This entry was posted in Uncategorized and tagged #rettsyndrome, adventure, awareness, camp, family, girl, lajollashores, sandiego, sk8tr, sk8trgirl, skatergirl, surf, surfer, surfergirl, travel, vacation. Bookmark the permalink.